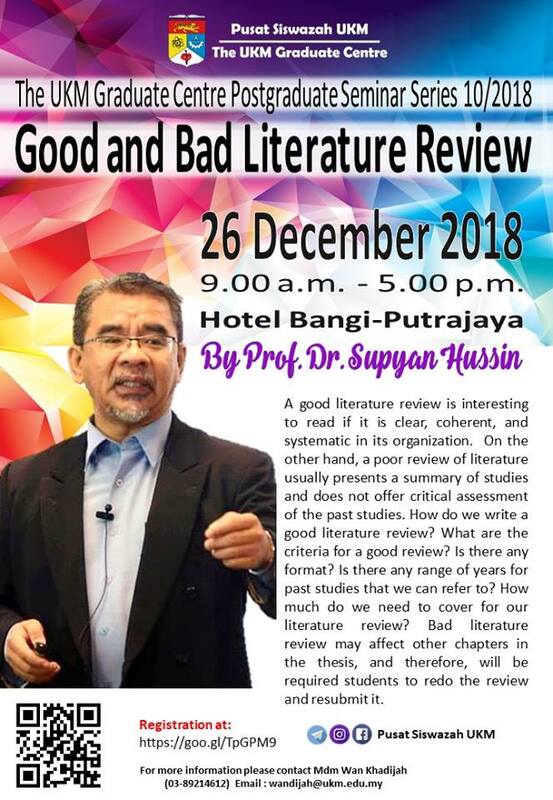 The UKM Graduate Centre Postgraduate seminar series 10/2018: Good and Bad Literature Review. The UKM Graduate Centre is pleased to invite you to join The UKM Graduate Centre Postgraduate Seminar Series 10/2018: Good and Bad Literaure Review by YBhg. Prof. Dr. Supyan Hussin from ATMA. Please feel free to contact us for any enquiries. You may contact Mdm Wan Khadijah at wandijah[at]ukm.edu.my or call 03-8921 4612.